It is said that Moses was the meekest man above all others on the face of the earth! (See Numbers 12:3) Imagine that for a moment! Here is someone who walks into the court of Pharaoh from whose condemnation he fled years before. Moses then performs miracles by the hand of God bringing about the liberation of the entire enslaved population of the Hebrews. He leads them out of Egypt. From there he parts the Red Sea, leading these ex-slaves in the wilderness for forty years - refining and preparing them to receive the inheritance of the Promised Land given to them by God so long ago. There in the Wilderness of Sinai he receives the covenants of God’s Law while on the mountain and sees God face to face. Not exactly the average Mr. Milk Toast, as defined by today’s ideas about the word “meek”! So, we might ask, what’s so unique about meek, since Jesus also invites us to learn meekness of Him? Certainly we’d have to agree that the Biblical kind of meek does not mean weak! It certainly is not characterized by being a doormat. In fact it’s remarkably resilient, powerful, and no nonsense. Meekness here, rather than referring to timidity, is the boldness which comes only from full surrender to the Spirit of the Living God and to our Heavenly Father’s will - which always has the best and highest in mind for us! Our meekness results in His strength. Sometimes maybe we get a little confused about how this meekness thing works. One of the best and surest ways meekness operates is through the prayer attitude of Jesus before His betrayal in the Garden of Gethsemane. “Thy will, not mine, be done!” He prays. Obviously this requires radical commitment as well as being able to see beyond the cross and our daily co-crucifixion in Jesus. Yes, we see beyond the cross and hold the vision of our resurrection and ascension - also in Him. We have to understand that the way to is the way through, and surrender the ego self to it. Meekness has everything to do with the inner view of what we call “faith”. I think the NASB has an easy-to-comprehend definition of that in Hebrews 11:1 - “the assurance of things hoped for, the conviction of things not seen.” Without a faith-view, it’s virtually impossible to practice meekness, for faith is not ever really “blind”. Perhaps it would be good at this point to prayerfully pause for awhile to consider how God may be calling on us for this kind of meekness in our own life... How does that look? Where is my ego holding me back, with its personal agendas and opinions for its own fulfillment? Preceding this personal working knowledge is the heart that completely desires the Father’s will, having first experienced His unconditional Love (See 1 John 4:19). We’ve seen God’s Love for us in action. We know we can trust Him in whatever He asks of us. It means abiding in His Holy Spirit and in His Scriptural Word. Surrender in this case is built on a deep and lasting trust in Divine Wisdom through the experience of its workings. There is no doubt that the journey He leads us on will have a blessed destination. We realize, know, and understand that He never leaves us or forsakes us - no matter where He takes us. Thus is it not a fairly simple matter to surrender oneself to Him, or to practice meekness, since we know of His wholly reliable and unconditional lovingkindness toward us? Simple in theory, but practice is another matter, we might say. More easily said than done? But this is the point: learning meekness is a spiritual practice. And practice makes perfect, they say... 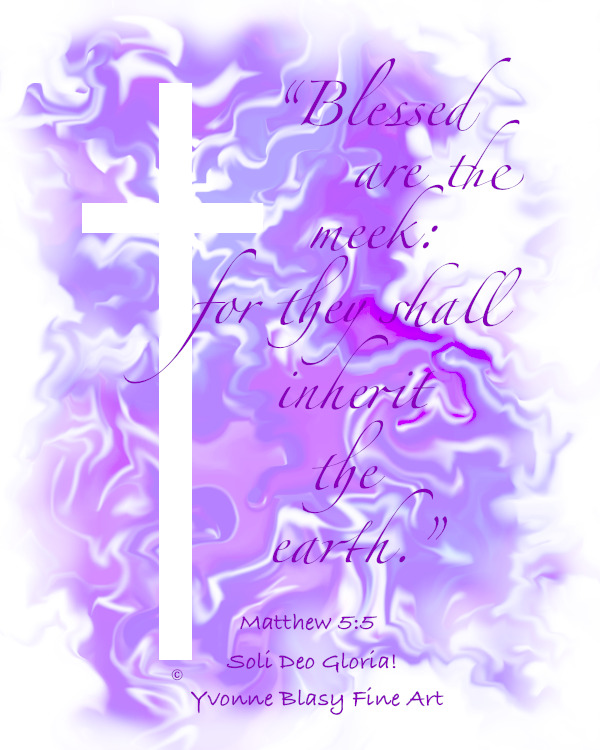 The quality, the virtue, of meekness grows as we allow God to aim His grace toward us, and through us out into life! The more surrendered to Him we become, the more we manifest His image and likeness in the world. A concluding exercise: Pray about and ponder the promise of Jesus as to how it is that the meek shall inherit the earth, in spite of what we perceive as the situation with current events.